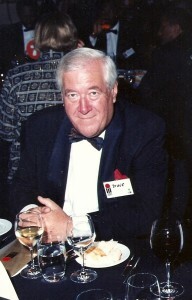 SMPTE members will be deeply saddened to hear of the passing of Bruce Robertson (Robbo) on 14 November 2012. Bruce’s pioneering spirit is echoed in the many technological innovations and engineering successes that he brought to the Nine Network over the years, and he has left an indelible mark on the development of Television in Australia. Bruce Robertson enjoyed a long and successful career spanning over 50 years, and culminating in his appointment as Executive Vice President of Engineering for the Nine Network. He will be particularly remembered for his numerous contributions to the television industry in Australia, particularly his contribution to development and roll out of Digital Television and High Definition Television. Bruce pioneered many firsts during his 42 years with the Nine Network. During this time Australians witnessed the introduction of the first colour TV services, stereo sound, international transponder services, and digital television services. Few Australian consumers understand how much of the current technology platforms can be traced back to Bruce’s work. Among Bruce’s other numerous achievements were the design of the standards converter used to provide coverage for Australian audiences for the man-on-the-moon project, writing spectrum planning and television studio design in the Asian Region. He also wrote the lighting specification for the Sydney Cricket Ground, leading to an approach which has become a world standard. He retired from the Nine Network in 2003, but retained his commitment to the industry as an advisor to the Nine Network, and through direct involvement in special industry-related groups. In 1990 Bruce was honoured with the Paul Marlan Award by Free TV Australia for his work toward the advancement of television broadcasting. He was the chairman of the FACTS specialist group DTTB, and led the development and introduction of digital television in Australia. He was a member of the IBC council and a member of the College of Electrical Engineers, the Institute of Engineers Australia and the New York Academy of Sciences. Bruce was a great supporter of SMPTE, was instrumental in the development of the SMPTE Conference and Exhibition concept, and was one of the organisers of the first such event in 1984. In recognition of his contribution to the industry, his technology leadership played on a global stage, and his work with the Society, Bruce was appointed a Fellow of the SMPTE in 1999. It can be truly said that Bruce Robertson was a man of passion and pride, a thoroughly gregarious and approachable colleague, and a perfectionist who loved the broadcast industry. We will miss him. A service will be held on Friday 23 November 2013 at the Macquarie Park Cemetery & Crematorium, in the Palm Chapel.